Description In this chapter we cover the importance of colorsThis glossary term has not yet been described. in dermoscopyThe examination of [skin lesions] with a 'dermatoscope'. This traditionally consists of a magnifier (typically x10), a non-polarised light source, a transparent plate and a liquid medium between the instrument and the skin, and allows inspection of skin lesions unobstructed by skin surface reflections. Modern dermatoscopes dispense with the use of liquid medium and instead use polarised light to cancel out skin surface reflections.. ColorsThis glossary term has not yet been described. are important becaus they provide important information on the type and anatomical locaiton of the pigment in the skin and its appearance in dermoscopy. Color, Pathology, Dermatopathology, Dermoscopy, Melanoma, Nevus, Colors Colors – cite! Colors (message) Colors – participate! Colors in skin lesions can provide important morphologic information: Melanin is the most important chromophore in pigmented skin lesions. Depending on the anatomic location and concentration of melanin in the skinThis glossary term has not yet been described., the colors perceived on dermoscopy range from black to blue (i.e., Tyndall effectCaused by light scattering by particles in a medium. The longer-wavelength light is more transmitted while the shorter-wavelength light is more reflected via scattering.). If melanin is located in the stratum corneum or immediately beneath it, the lesion would appear black on dermoscopy. Melanin at the dermoThis glossary term has not yet been described.-epidermal junction (DEJ) would be perceived as light brown to dark brown, depending on its density. Melanin in the dermis results in shades of blue to gray. 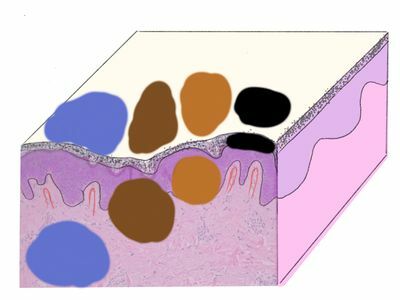 Thus, the colors seen on dermoscopy allow the clinician to predict the anatomic location of the cells that contain melanin (e.g., melanocytes, keratinocytes, and melanophages) and identify the deepest component of a melanocyticThis glossary term has not yet been described. tumor (a blue area will probably reveals its deepest component). Other important determinants of lesion color include hemoglobin in red blood cells (pink to red colors), lipids or keratin (yellow) and collagen fibers in the dermis (white colorColor (American English) or colour (Commonwealth English) is the characteristic of human visual perception described through color categories, with names such as red, yellow, purple, or blue.). Some colors, especially when associated with selected dermoscopic structuresThis glossary term has not yet been described., also have important histopathologic correlates, such as white globules (associated with balloon-cell changes) , homogeneous yellow to orange areas (associated with cell xanthomization)  or black lacunaeThis glossary term has not yet been described. (associated with blood thrombosis). ↑ Jaimes et al. : White globules correlate with balloon cell neviThis glossary term has not yet been described. nests. J. Am. Acad. Dermatol. 2011;65:e119-e120. PMID: 21920229. DOI. ↑ Bañuls et al. : Yellow and orange in cutaneous lesions: clinical and dermoscopic data. J Eur Acad Dermatol Venereol 2015;29:2317-25. PMID: 26369295. DOI. This page was last modified on 3 December 2018, at 16:18.